ANN ARBOR, MI – A single mother and her 4 children were trying to enjoy a night out for some ice cream at a local ice cream stand in Ann Arbor, Michigan. The lines were long and the children impatient, which was wearing down the agitated mom. The mother, 38 year old Patricia Hill, was being very vocal with her children and shouting to the workers inside to “speed it up”. 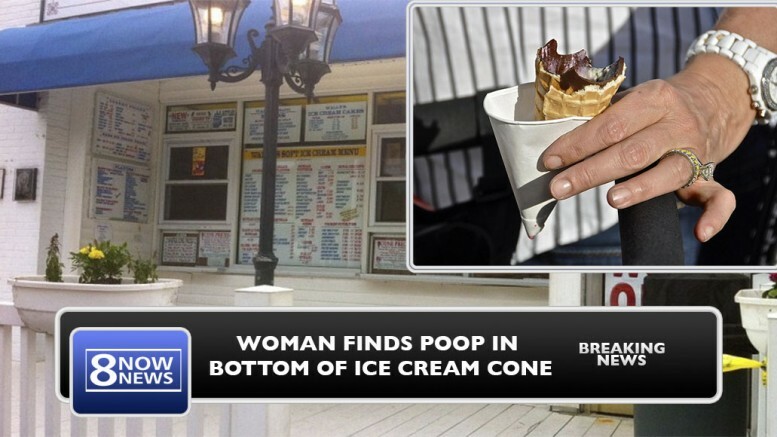 According to Hill, she feels it was her bad attitude that landed her with a pile of poo hidden in her ice cream cone. (I guess they can call it “32 Flavors” now…) It took several minutes for her to calm down, and at that point she called the police. According to police reports, the owner was called in and samples of the feces were sent to the local health department. The manager, who was identified as Raymond Burr, was ordered to give a DNA sample to be tested against the human feces found in Hill’s ice cream cone. After one week, the test results came back positive. Hill is now suing the ice cream stand for $1 million in damages. Burr, who has no criminal history, is facing charges for the incident.